Hope his team mates help pay for it if he doesn't won the appeal. Will his appeal hinge on SOS's theory that he was involved in the play therefore its not an illegal hit? Pssst. MH. It's being discussed in their version of TACT thread. The price of progress is trusting the process. After seeing the picture i thought it could of gone either way because he did lead with his shoulder at first and he did get in front of him Lee just didn't see him. He didn't initially contact the head. 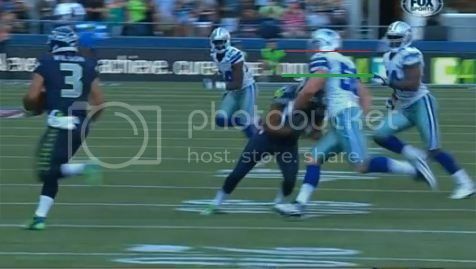 The reason the facemask made contact was due to Lee's head whipping forward. I guess this is today's NFL though and unfortunately it is what it is. Tate SHOULD appeal. Tate benefits from protection as a defenseless player, why shouldn't Lee? Tate was trying to get in front of him though it's just that Lee wasn't paying attention to him i think what got Tate was a little bit of his helmet hitting Lee in the neck area. What B/S this league is getting so weak now a days. You know Tate could've went for Lee's knees and completely torn both of his ACLs and given himself a concussion in the process, I'm sorry but that was a CLEAN pill-back block, if I've ever seen one... Goodell is ruining this game with this safety B/S... IT WAS A CLEAN BLOCK, The only reason it was fined was because it looked worse that it was. Actually. Blame the players. Lawsuit after lawsuit directed at the NFL for lack of safety has caused these rules to be implemented. Goodell has to protect his company - and part of that is to prevent these lawsuits from former players. Yeah well there's one problem with your theory, You're judging the hit on where Tate's helmet ended up and not judging it on where Tate's helmet began... and for anyone who can SEE, can see that Tate's helmet started in Lee's midsection and ended up at the head area..... If Tate can't play his fines I'll happily help him the best I can. He planted his feet and exploded upward into Lees helmet - just because he started at chest level doesn't matter. He turned his body into a blind side upper cut and every definition of the rule declares it illegal. I am under the impression that any and all hits leading with the crown of the helmet, regardless of where the initial conctact point is. That's a crock, Goodell has been trying to enforce anything and everything because his a power hungry pig, there has been plenty of hits in the past that where he fined the player and everyone in the NFL community Players/Coaches/Fans and (even the player that was hit) have said Goodell completely missed on that fine... I mean c'mon the first year the NFL has an appeals panel in place and they overturn 4 suspensions for lack of evidence.... That right there is cute, This isn't Goodell's company there are 32 owners in this company and none of them go by the name Goodell.